My grandma’s death last year was difficult. She’d had Alzheimer’s for many years, so in a way, our loss was more about the years we lost during her life than about her death. Alzheimer’s also meant there were no attics to search for treasures, no inspiring little finds; those things had been done long ago. 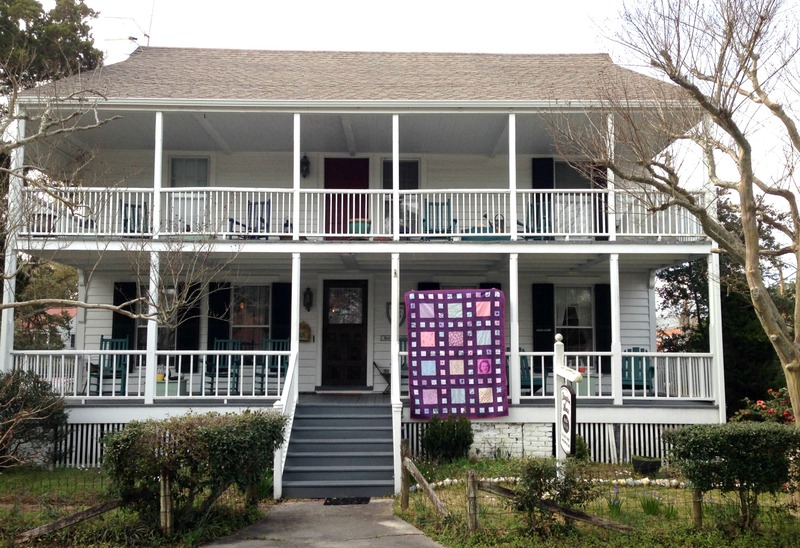 All that was left with her really were the pajamas she wore in the nursing home and a favorite print she’d received as a gift from her brother. 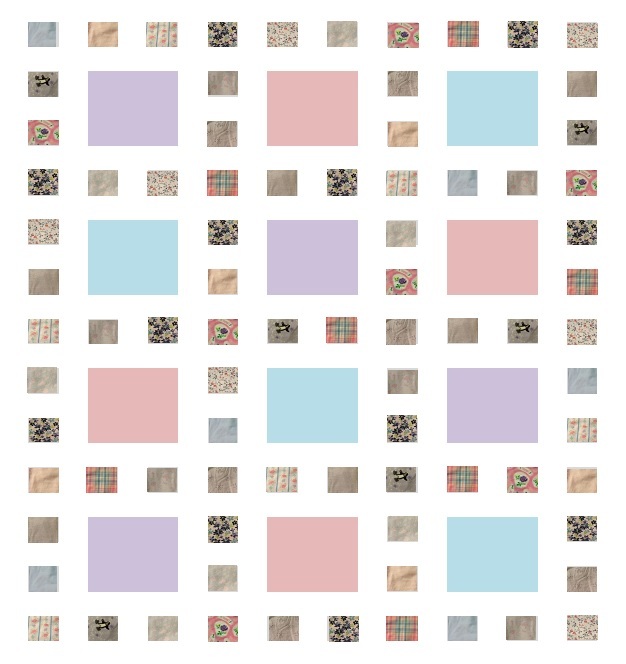 I decided to use the pajamas to make a memory quilt. I decided to incorporate small pieces of the pajamas with larger 1930s reproduction prints. 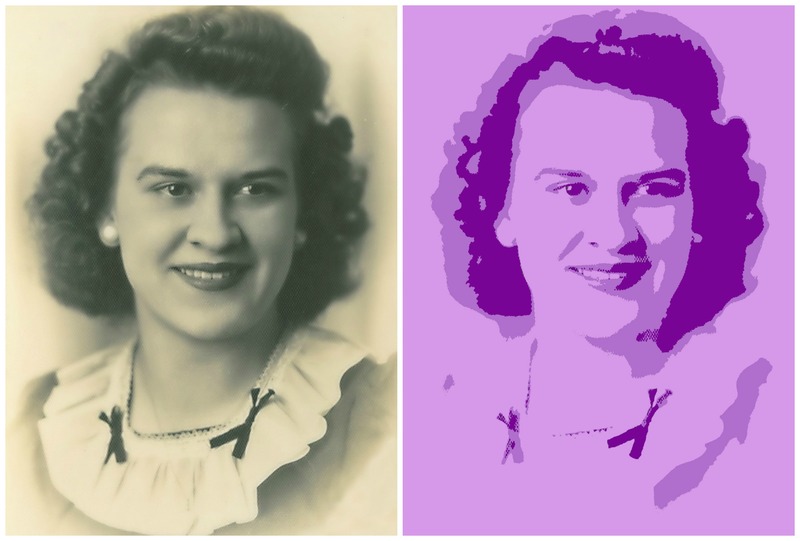 It wasn’t until I started researching 1930s repros that I realized where my grandma got her style. All those cartoon kittens and ducks? Straight from the 1930s! I decided on a layout that would showcase both the repro prints and the pajama pieces. At first, I thought I would use a white background. 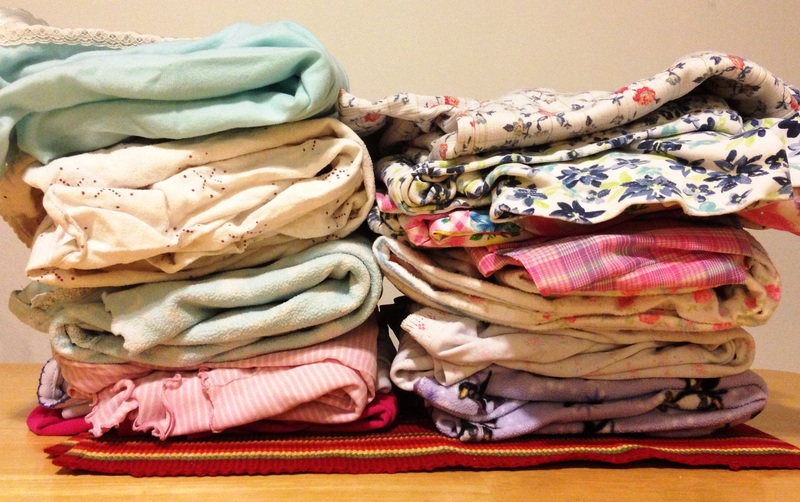 Then I realized some of the pajamas were a little dingy from multiple washings. A quilt store employee in my home state suggested I use a darker color to make the smaller pieces pop. Although pinks and purples aren’t my style, they were my grandma’s. 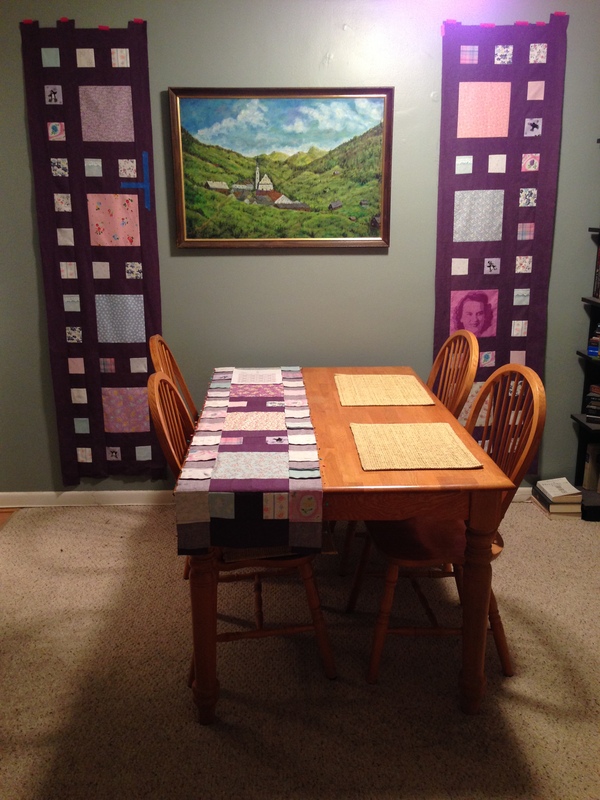 I decided to use a purple (Robert Kaufman’s Quilter’s Linen). With a color scheme my grandma would have liked, I decided to include a few details that would also make it more “me.” I wanted this to be a quilt that linked us through the generations. In particular, I wanted a pop photograph of my grandma on the quilt. I think on one hand she would have hated it and thought it was too ostentatious. On the other hand, I think she would have been flattered and would have thought I was being goofy. It makes me smile to think that she would have teased me for my selection. I turned a photo of hers into a Spoonflower design and had it printed. My grandma was BIG on sending birthday cards, sympathy cards, letters, etc. She kept every card she ever received. Ever. I wanted to somehow incorporate that part of her into the quilt. 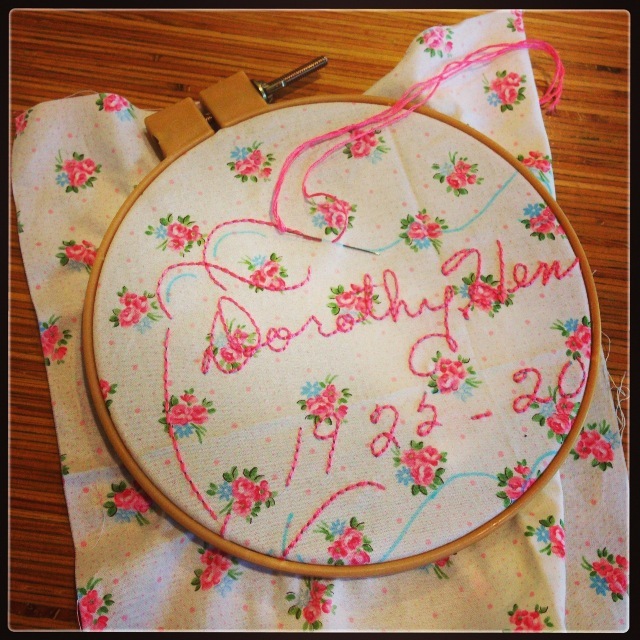 I used her birthday calendar to get samples of her handwriting, then embroidered her name and dates onto one of the quilt squares. I was lucky she had several friends with the same first name, and obviously family with the same last name, so it was easy to cobble together her name! When it came time to bind the quilt, only one color would do. Fuscia was her favorite. 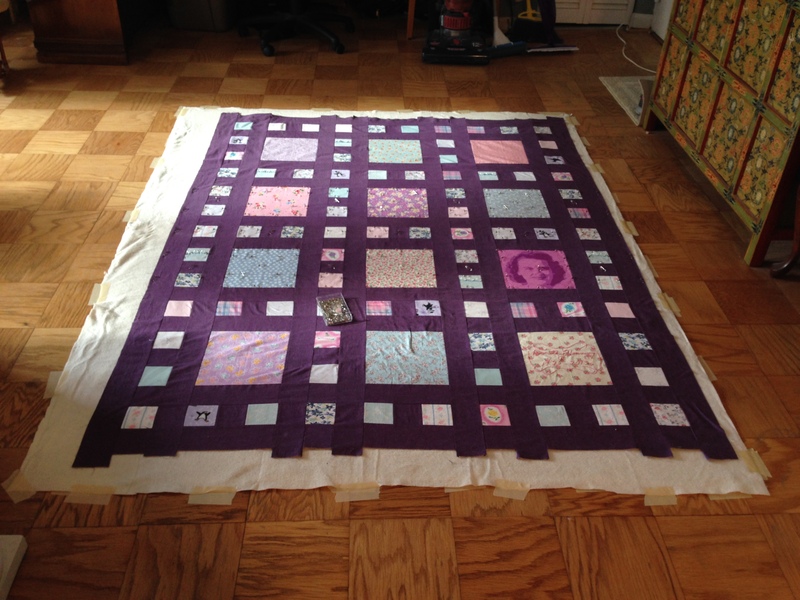 For the quilt back, I used up the remaining portrait fabric. (I bought a yard so I would be sure to have at least one full portrait, plus a few extras in case I messed up.) I also used smaller pieces of 1930s feed sacks that I bought on Etsy, along with 1930s repro prints. I kept the quilting simple, using straight lines along the outsides of the bigger/repro squares with painter’s tape to mark the lines. The finished quilt is lap size. This is a quilt I think my family will appreciate for a long time. My mom (whose mother is memorialized in this quilt) has first dibs, and if she decides the colors are too bright, my sister has expressed interest. My sister said the sweetest thing, “There aren’t many things left from Grandma. If I have kids someday, I would love to show them this quilt and tell them what I remember about her. 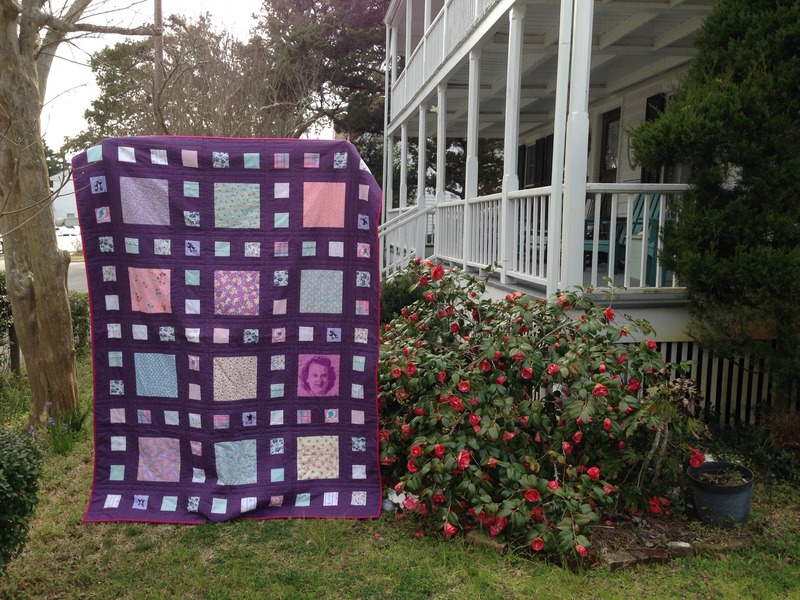 It would be my way of passing along her memory.” How could a quilt be more appreciated?! I am so glad to have created a piece of family history. Another great thing about this quilt is it was finished in February, which means my current finish rate is one quilt per month! I don’t know that I can keep it up, but I feel such a sense of accomplishment in 2014 so far. Categories: Quilts | Tags: 1930s, 1930s feedsack, 1930s repro, 1930s repro prints, 1930s reproduction, 1930s reproduction prints, basting, depression, depression era, design, embroider, embroidery, fabric, feed sack, feedsack, flour sack, grandma, great depression, heirloom, heirloom quilt, memory quilt, pajamas, photo editing, photoshop, portrait, quilt, quilting, signature, simple quilt design, simple quilt pattern, spoonflower, world war 2, world war ii | Permalink. What a wonderful memory quilt for you and your family. I bet your grandma would be amazed at how you used her pajamas. 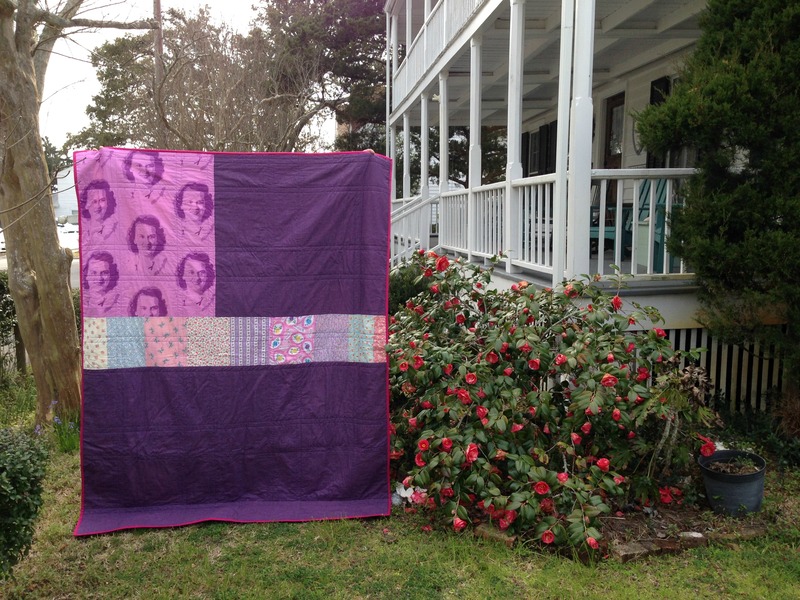 I love the way you incorporated her picture and handwriting into the quilt too, that really brought it to life. 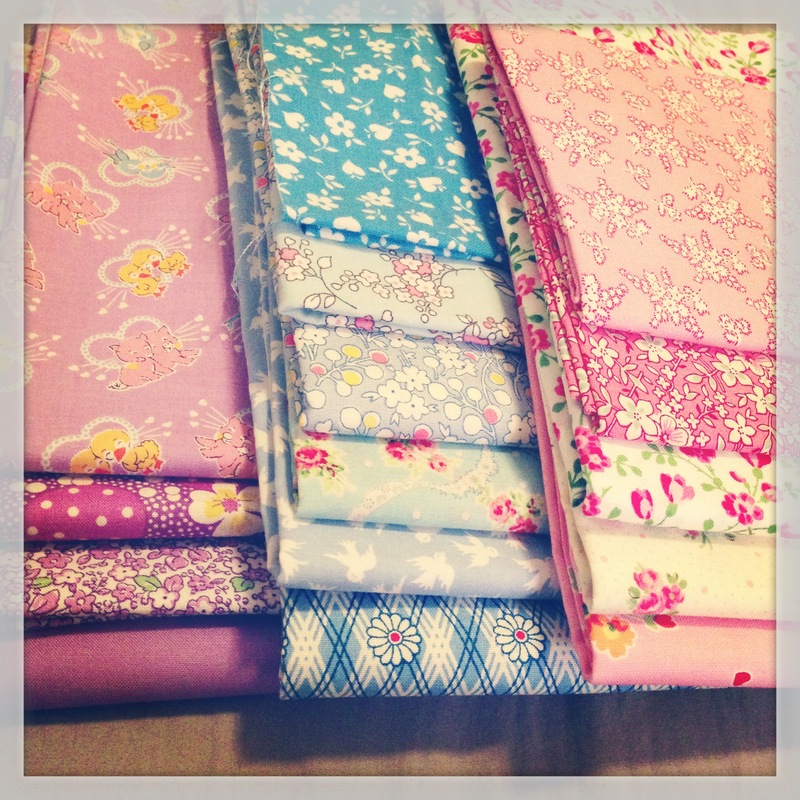 The reproduction fabrics that you chose were perfect. We can tell you put a lot of thought and heart into this quilt. Great job! I really appreciate the feedback, especially since this quilt means so much to me. You made my day!